We are delighted to stock the excellent Fallen Fruits Oval Fire Bowl. With so many available today, it is wise to have a brand you can trust. The Fallen Fruits Oval Fire Bowl is certainly that and will be a great purchase. 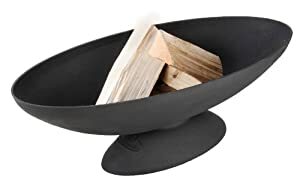 For this price, the Fallen Fruits Oval Fire Bowl comes highly recommended and is always a regular choice with most people. Fallen Fruits have included some excellent touches and this means good value for money. This black oval cast iron fire bowl FF132 from Esschert Design will make a decorative addition to your patio space while keeping you warm by the fire. The fire bowl is a perfect source of low flames for illumination and warmth in the evening. Made of cast iron, this outdoor fireplace is strong and durable. Delivery does not include wood.